Sentinel Peak, aka A Mountain provides views of the city as a backdrop for your wedding. Catalina State Park, 11570 N. Oracle Road. The Pima Air and Space Museum provides a different backdrop for your wedding. Once you decide who you'll spend the rest of your life with, figuring out WHERE to start that chapter is the next big decision to make. You could go with a resort and stay on the property with your guests or opt for a church and probably save a lot of money. But if neither of those options sound like you, Tucson has an abundance of other venues. Check out Stardance Event Center, 8110 N. Scenic Drive. You get both indoor and outdoor options here with views of the Tucson Mountains and Sombrero Peak (think about your photos 😍). If you love the western vibe, you could totally play it up here — or just add a few touches for a more subtle approach. The indoor reception area looks like a renovated barn, so your cowboy boots will be perfectly at home. Here are three other, non-resort venues that have whispers of the Wild West: The Oasis at Wild Horse Ranch, Good Shepherd Ranch and the Savoy Opera House. The Stillwell House and Gardens, 134 S. Fifth Ave., is just south of Broadway. It's basically a historic mansion with a beautiful courtyard, gardens and a cantina downtown. The location means your guests have lots of after-party options. Here are three other downtown Tucson venues: Copper Hall at Hotel Congress, The Z Mansion and The Carriage House. Get married with nothing but trees and mountains surrounding you at Catalina State Park. This is also a super cheap venue, because, well, nature. You'll be sharing the grounds with hikers and campers and need to bring just about everything for the day. Also, there's no dance floor. But maybe you won't mind when you're dancing under the stars. Here are three more venues that will satisfy your craving for the great outdoors: Sentinel Peak ('A' Mountain), Tucson Botanical Gardens and Arizona-Sonora Desert Museum. Then you need airplanes at your wedding. You can plan an event at the Pima Air and Space Museum, 6000 E. Valencia Road and get married under airplane wings. For real. The museum also has catering. Here are three other unforgettable places to say 'I do': Reid Park Zoo, Whistle Stop Depot and the Tucson Museum of Art. Park Avenue Weddings, 242 S. Park Ave., is a kind-of funky space with a stage area that looks like the caboose of a train. That's where you'll get married. The space can accommodate up to 200 guests, so not that small, but we think this would be a lovely venue for a smaller group. Tucson was the top spot in Arizona on the list. Now that you're engaged (congrats, btw), it's time to think about engagement photos. 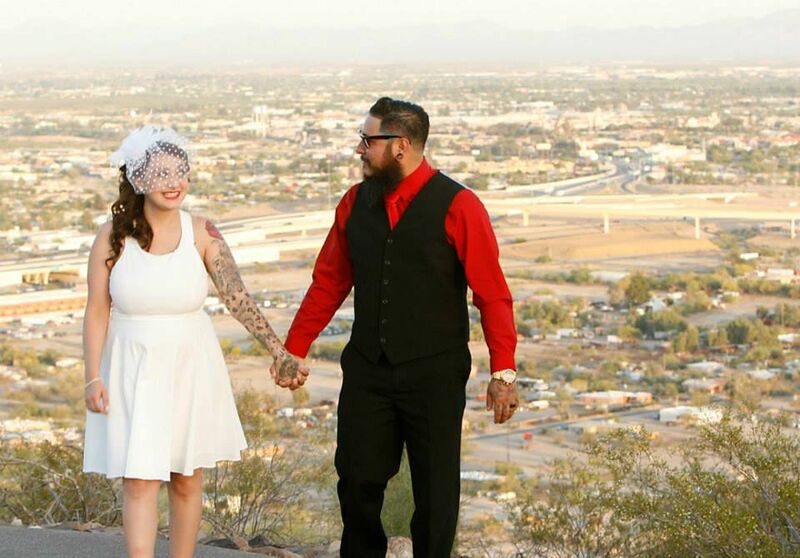 Some very Tucson ways you can help those in need and make your wedding day even more special. Cactus. Sunsets. Tacos. So much to love. Don't panic. You don't have to spend that much to have a beautiful wedding. Have you thought about using AirBnB as a wedding venue? If you're looking for a wedding venue that's a little different from a resort, hotel or church, you might want to consider vacation rentals. If you dream of a downtown city wedding, you can see what that might look like Monday night. Your fiance is amazing, obviously. Maybe you got engaged over the holidays, with twinkly lights overhead and a chill in the air. You can chat with around 100 vendors. She was inspired after planning her own wedding in 48 hours.